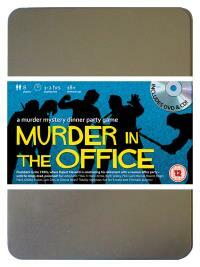 You've been invited to play the role of RUTH LESLEY in Murder In The Office. Who killed the boss? Everyone has stayed after work to attend Rupert Maxwell’s retirement party. Not because they like him, but because they want to make sure he is really going, once and for all. With no expense spared, his P.A. has organised an Eighties throwback disco and the cheapest bubbly money can buy - but just as the party starts the bloated M.D. falls down dead. Find out who made Maxwell’s party a real choker! Executive (she’ll do anything for a plush corner office!) Costume : Dressed to impress, your sharp business suit is cut in all the right places. Your blouse is low-cut enough to close any deal, and the latest mobile phone completes your corporate high flyer look. As an executive at Maxwell Enterprises, you set out to prove that women can be just as dedicated and resourceful as men. Over the last two years, you’ve earned a reputation for being hard-nosed but you don’t care what people think. You are ambitious, intelligent and determined, with a strong business mind. Your aim is to be running your own company by the time you’re forty.